Above: A very popular buoy-shaped monument proclaims to be the southernmost point in the continental United States. (The actual southernmost point on Key West is inside the Navy base and not accessible to civilians). Right off Mallory Square Dock and close to Pier B is Mallory Square. 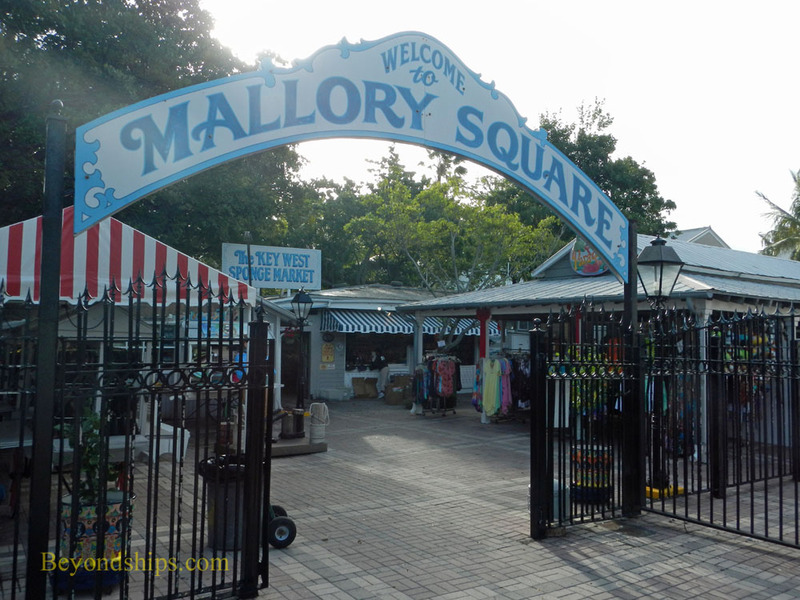 This broad waterfront plaza has long been a social and commercial hub of Key West. Around the Square are some historical monuments. It is home to a sculpture garden with statues of significant figures in Key West history. It is also the site of the Key West-Florida Keys Historical Military Memorial, which has ten stations nine of which provide information regarding different military actions in which Key West or the Florida Keys played a major role. The tenth has the names of Florida Keys residents who died in the service of their country. Nearby is a turret from the battleship USS Maine, which sailed from Key West on her final voyage. The sinking of the Maine in Havana harbor led to the Spanish-American War. Mallory Square is best known for its daily sunset celebration. Visitors and locals start to gather two hours before sunset and watch the sun sink into the Gulf of Mexico. To entertain them are all varieties of street performers. There are also vendors selling food and beverages. Unfortunately, most cruise ships calling at Key West (especially those docked at Mallory Square) leave before sunset. As a result, most cruise passengers are unable to participate in the sunset celebration. Bordering the square are quite a few shops including the Sponge Market, which features natural sponges. Harvesting sponges from the sea was once an important part of the Key West economy. 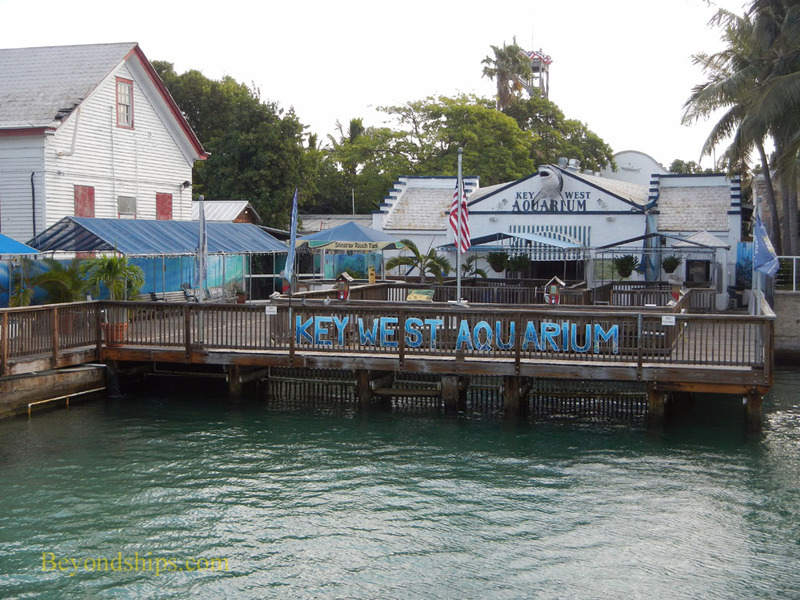 Close to Mallory Square and Pier B is the Key West Aquarium. Begun in 1935, the Aquarium is now home to alligators, sharks, sea turtles and tropical fish. Visitors can learn about the various types of marine life that inhabit the water around Key West and Florida. The most prominent landmark in the area around Pier B and the main business district of Old Town Key West is the Custom House. It was built at the end of the 19th century to house the custom's office, the post office and the federal district court. Later it was passed to the Navy who used it as a headquarters for operations in the Caribbean and the Gulf of Mexico. 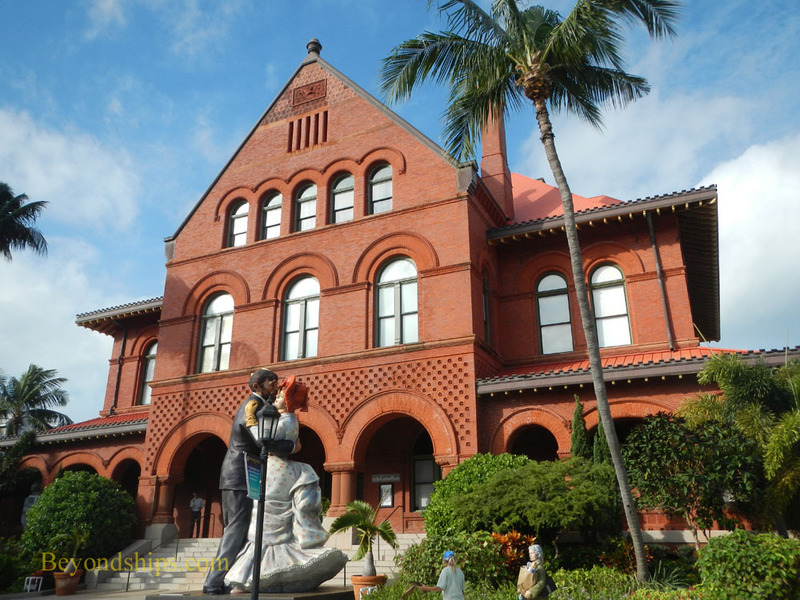 In 1991, it was purchased by the State of Florida, which leased it to the Key West Art & Historical Society as a museum. Museum exhibits focus on local history and exhibits by local artists. Nearby are two museums with a maritime theme. In 1985, Mel Fisher discovered the wreck of a Spanish galleon, which contained a multi-million dollar treasure trove. The Mel Fisher Maritime Heritage Museum carries forward his work with exhibits on marine archaeology and conservation. Exhibits include various treasure items discovered under the sea as well as an exhibit about the slave trade. In the 19th century, Key West grew wealthy and prosperous in part because of shipwrecks. When a ship would wreck in the reefs surrounding the keys, salvage parties would go out to recover the cargo and anything valuable from the ship. The Key West Shipwreck Museum tells the story of this industry. Using actors, film and artifacts, the museum illustrates this story by focusing on the recovery of the vessel Issac Allerton. Key West is known as a party town and there are many bars in town to facilitate the partying. However, three saloons near the intersection of Duval Street and Greene Street - - the traditional heart of Key West - - are of particular note. 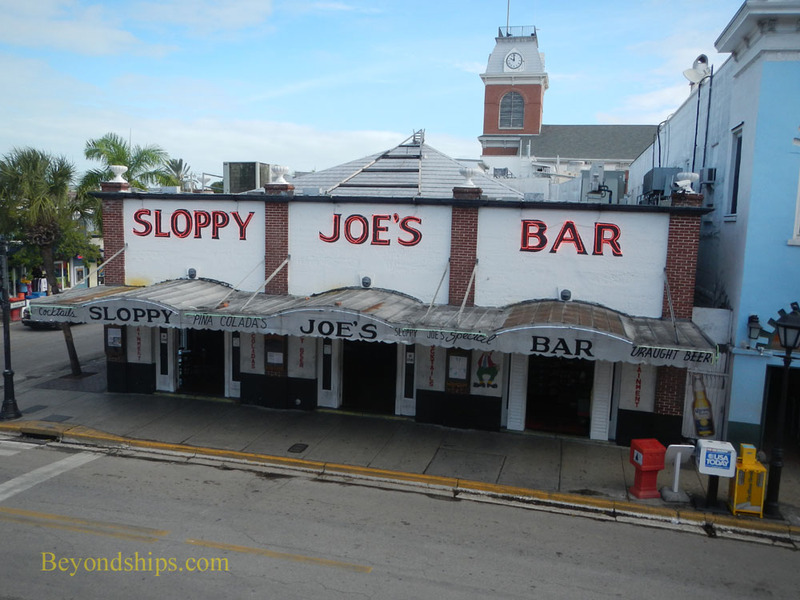 Sloppy Joe's Bar is perhaps the most famous. Founded in 1933, it was Ernest Hemingway's favorite watering hole. Indeed, the story goes that the bar had a wheel barrow that was used to carry the writer home. However, in 1937, Sloppy Joe's moved. 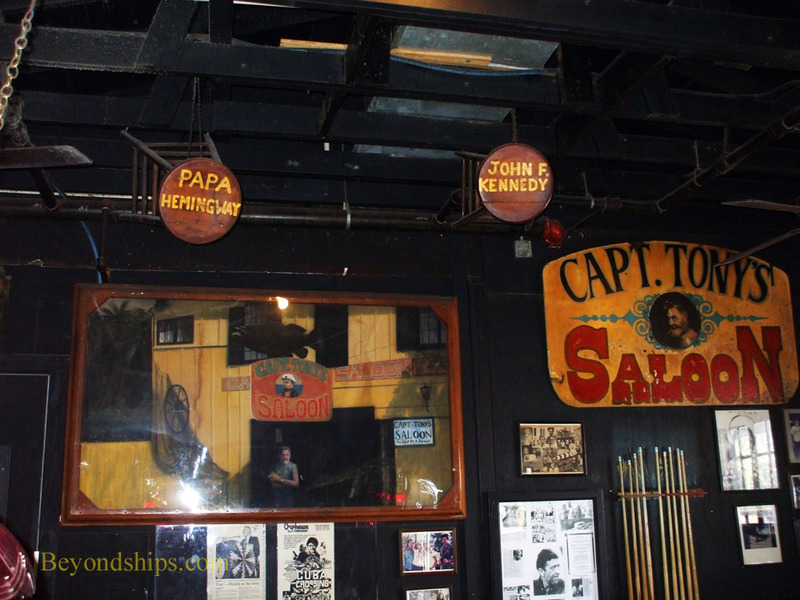 The original saloon where Hemingway did most of his cavorting is now Captain Tony's Saloon. A practice at Captain Tony's is to label a bar stool with the name of each celebrity who has been there. In addition to Hemingway, Presidents John F. Kennedy and Harry Truman's names appear on bar stools. Across Duval Street from Sloppy Joe's is another well-known Key West watering hole. In fact, Rick's/Durty Harry's is a complex of eight bars encompassing everything from a saloon to an elegant champagne bar. The main entrance is marked by a giant monkey pistol tree growing out of the sidewalk on Duval Street. 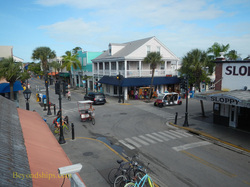 Patrons can sit by an open air-bar and be part of what is happening on Key West's main street. Inside on the stage of the rock bar, you never known who may join the band. For example, Jimmy Page (Led Zeppelin, Yardbirds) jammed there one evening while holidaying in Key West. Above and right: Captain Tony's Saloon.